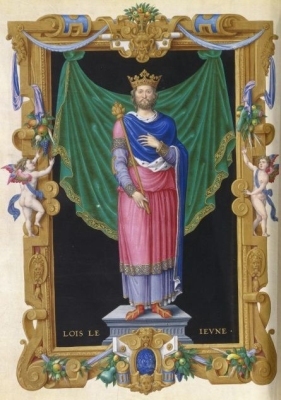 Louis VII, Roi des Francs was born circa 1121.3 He was the son of Louis VI Capet, Roi des Francs and Adelaide di Savoia.1 He married, firstly, Eleanor, Duchesse d'Aquitaine, daughter of Guillaume X, Duc d'Aquitaine and Eleanor Châtellérault de Rochefoucauld, on 25 July 1137 at Bordeaux Cathedral, Bordeaux, Dauphine, FranceG.4 He and Eleanor, Duchesse d'Aquitaine were divorced in 1152 on the grounds of consanguity.3 He married, secondly, Constanza de Castilla, daughter of Alfonso VII, Rey de Castilla and Berengaria de Provence, in 1154. He married, thirdly, Adele de Champagne, daughter of Thibaud IV, Comte de Blois and Matilda Prinzessin von Kärnten, on 13 November 1160.5 He died on 18 September 1180 at Paris, FranceG.5 He was buried at Abbey Barbeaux, Melun, Île-de-France, FranceG. [S38] John Morby, Dynasties of the World: a chronological and genealogical handbook (Oxford, Oxfordshire, U.K.: Oxford University Press, 1989), page 77. Hereinafter cited as Dynasties of the World. [S11] Alison Weir, Britain's Royal Families, page 58. [S6] G.E. Cokayne; with Vicary Gibbs, H.A. Doubleday, Geoffrey H. White, Duncan Warrand and Lord Howard de Walden, editors, The Complete Peerage of England, Scotland, Ireland, Great Britain and the United Kingdom, Extant, Extinct or Dormant, new ed., 13 volumes in 14 (1910-1959; reprint in 6 volumes, Gloucester, U.K.: Alan Sutton Publishing, 2000), volume XII/1, page 496. Hereinafter cited as The Complete Peerage. [S6] Cokayne, and others, The Complete Peerage, volume XII/1, page 497. Sancho VI, Rey de Navarre was born after 1132.2 He was the son of Garcías IV, Rey de Navarre and Margaret de l'Aigle.3 He married Sanchia de Castilla, daughter of Alfonso VII, Rey de Castilla and Berengaria de Provence, on 2 June 1153. He died on 27 June 1194. [S11] Alison Weir, Britain's Royal Families: The Complete Genealogy (London, U.K.: The Bodley Head, 1999), page 64. Hereinafter cited as Britain's Royal Families. Conan IV de Bretagne, Duc de Bretagne was born after 1137. He was the son of Alain II de Treguier, Earl of Richmond and Berthe de Bretagne. He married Margaret of Scotland, Countess of Hereford, daughter of Henry of Huntingdon, Earl of Huntingdon and Ada de Warenne, between 1159 and 1160.2 He died on 20 February 1171. He gained the title of Duc de Bretagne in 1156.1 He gained the title of Earl of Richmond.1 Conan IV de Bretagne, Duc de Bretagne also went by the nick-name of Conan 'Le Petit'. [S11] Alison Weir, Britain's Royal Families: The Complete Genealogy (London, U.K.: The Bodley Head, 1999), page 60. Hereinafter cited as Britain's Royal Families. [S11] Alison Weir, Britain's Royal Families, page 195. [S6] G.E. Cokayne; with Vicary Gibbs, H.A. Doubleday, Geoffrey H. White, Duncan Warrand and Lord Howard de Walden, editors, The Complete Peerage of England, Scotland, Ireland, Great Britain and the United Kingdom, Extant, Extinct or Dormant, new ed., 13 volumes in 14 (1910-1959; reprint in 6 volumes, Gloucester, U.K.: Alan Sutton Publishing, 2000), volume III, page 168. Hereinafter cited as The Complete Peerage. She gained the title of Prinzessin zu Löwenstein-Wertheim-Rosenberg. [S213] Unknown author, "unknown article title," European Royal History Journal: volume 8.4, page 33. [S213] "Unknown short article title", volume 8.4, page 37. William fitz Robert, 2nd Earl of Gloucester was born on 23 November 1116.1 He was the son of Robert de Caen, 1st Earl of Gloucester and Mabel FitzHamon.1 He married Hawise de Beaumont, daughter of Robert de Beaumont, 2nd Earl of Leicester and Amicia de Montfort, circa 1150. He died on 23 November 1183 at age 67. [S6] G.E. Cokayne; with Vicary Gibbs, H.A. Doubleday, Geoffrey H. White, Duncan Warrand and Lord Howard de Walden, editors, The Complete Peerage of England, Scotland, Ireland, Great Britain and the United Kingdom, Extant, Extinct or Dormant, new ed., 13 volumes in 14 (1910-1959; reprint in 6 volumes, Gloucester, U.K.: Alan Sutton Publishing, 2000), volume V, page 686. Hereinafter cited as The Complete Peerage. [S6] Cokayne, and others, The Complete Peerage, volume III, page 244. [S6] Cokayne, and others, The Complete Peerage, volume V, page 689. [S12] C. Arnold McNaughton, The Book of Kings, volume 1, page 70.